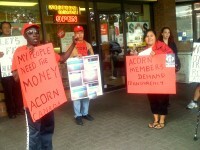 Ne w Orleans ACORN International’s global Remittance Justice Campaign (www.remittancejustice.og) continues to confront new, amazing, and mysterious challenges as ACORN Canada pushes forward in Ottawa and British Columbia. In a meeting won by actions at the ACORN Canada convention six weeks ago with top officials of the Finance Ministry our negotiators efforts to discuss the need for regulation of remittances to prevent predatory pricing and achieve needed equity, transparency, and fundamental fairness was greeted about the same way as if we had started cursing loudly at the front of the church. 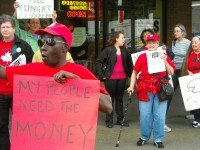 We had offended fundamental, conservative Stephen Harper government dogma about so-called “free markets” and laissez faire rapacious capitalism by banks and money transfer organizations, especially if the rip-off occurred with migrant workers and immigrant, “new Canadians” as they are called. transparent fees at receiving end if any or a guarantee that there are none. We might save billions just by letting that little light shine. At ACORN I guess Western Union thought it was important to remind us that with no regulations and little competition, rapacious corporate greed can pretty much stand on its hind legs and flip off its customers, their organizations, and entire limp wristed, uncaring governments at their whim and will. Hello! This entry was posted in ACORN International, canada, Remittances and tagged canada, Finance Ministry, Remittances, Western Union by wade. Bookmark the permalink.